We were established to provide specialized niche corrosion engineering products and services to a wide range of industries namely: Oil and Gas Refineries and Plants, Marine Industry, Voyage Repairs, Chemical and Pharmaceutical Plants, Power Generation Plants and Mine Facilities. 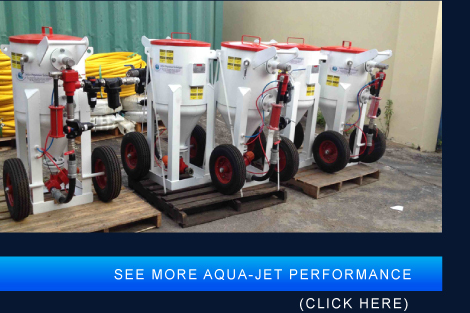 Aqua-Jet Wet Abrasive Blast Technology is a highly adaptable,flexible, safe and compact system that offers nearly low media consumptions, incomparable handling ease, exceptional cost savings, and substantial environmental protection. This technique allows us the flexibility to accommodate changes in a surface that’s being cleaned / blasted, adjusting at will, to go from heavy blasting to gentle cleaning as the surface distates. It does not matter what surfuce, Wet Abrasive Blast technologies distinguish themselves by perfect results on operations of all kinds with higher performance rates achieved.